“What happened about those poplar trees on the corner in Reydon?” asked Penny. We were in the middle of an observation exercise in the Bungay Library courtyard. Fourteen of us were being introduced to Permaculture by Graham Burnett of Southend in Transition. It was a full-on weekend intensive and it’s going to be my main theme this week. “About half of them were cut down,” I replied. And admitted I wasn’t sure about the rest, which are still there, although there had been plans to take them all down. At supper at Gemma’s on Saturday evening, I discovered that Paul, a tree surgeon and active member of the Green Party, had gone to investigate the trees and recommended they be left standing. And as far as he knew the remaining six were going to stay. Most of the post offices were closed. A lot of people love the poplar trees on the corner. The people were informed – by a letter posted on the trees. Until the trees were being cut down. The next letter posted on the trees was twice as long. (That’s my word for it). Other than to be used until you drop. The poplar leaves in the wind? In the village where you don’t live? About being spoken to like that? In 2010 the group plans to transform Bungay library courtyard into an inviting and sustainable green space and ‘living library’ with raised beds, compost bins, wormery and rainwater harvesting. With this in mind we asked permaculture teacher and author Graham Burnett http://www.spiralseed.co.uk/ from Southend in Transition to run a weekend introduction to permaculture at the library in January. 15 of us from Bungay and other local Transition initiatives immersed ourselves in two full-on days of theory and practical group exercises. The basis of the Transition movement (founder Rob Hopkins taught permaculture for many years), this approach is about “designing sustainable human communities by following nature’s patterns”. It works with the shapes of the living world (e.g. branches, waves, the spiral of snail shells, the scattering of dandelion seeds), rather than imposing artificial straight lines and boxes on it. Key before starting our project was how to take time to observe nature’s rhythms and cycles, rather than rushing for a quick fix. During the course we also learned how this ecological design system offers low carbon and energy saving solutions to food growing, transport, waste, the economy and community spaces. After the weekend it was my turn to write for the Transition Norwich community blog (18-22 January), and I go into more detail about the weekend there, so do have a look. Having gone through almost paralysing fear after becoming acquainted with the concepts of peak oil and climate change, I have emerged as someone willing to do my best for our future, and I am thoroughly enjoying it. I still have fears about the world my children will inherit, or even grow up in, but I hope they will understand how their environment works and be inspired to get involved with shaping it responsibly. I have to admit to a very shaky knowledge of economics, although I do question why our economy has to grow – what disaster would happen if we all had to be a little more localised or self-sufficient? Tying in with that thought, I have been inspired to learn new skills, especially those relating to domestic productivity. Not only do they save me money, but there is enormous satisfaction in learning how to do something for myself, especially if it turns out particularly well. So far I have turned my hand(s) to marmalade, jam, elderflower champagne, bread-making and knitting. I am going to learn about fruit and vegetable bottling and sewing later this year. The greatest obstacle to success has been time management, especially with 3 young children, however a little organisation can achieve a great deal. My latest venture has been into bee-keeping with Bungay Community Bees. There are many benefits to participating in a community group: I have enjoyed the sense of comradeship, exploration and support from both Sustainable Bungay and Bungay Community Bees – so much more can be achieved collaboratively. For example, I would love to know more about planting for bees but don’t have time to research the topic thoroughly – luckily two members of our group are particularly interested and are building a ‘bee calendar’ as one of their projects. I have made many friends in Bungay, all with similar over-arching concerns, all coming from a place of concern about the future and all rolling up their shirt sleeves and doing what they can within their own lives. But best of all, everyone has their own area of particular interest and so nobody has to do everything, or feel isolated and overwhelmed. There are positive aspects for our future after all. During our first year 37 members were recruited. With subscriptions set at £20 we raised enough money to buy 3 National Hives with basic equipment, smocks and veils, insurance for 2 keepers, training for 2 more keepers and 2 nucleus’ of bees. In addition we had 1 hive, some equipment and some bees donated to us. Members chose to participate as much or as little as they wished. This meant that although we never saw some members they were still receiving regular updates by e-mail, reports of the monthly summer meetings and a copy of the 2010 end of year summary. Visits to hives and any other significant events were also written up as a blog on the website. Others chose to attend meetings and visit hives and a new sub-group considering planting for bees was begun. During our second year we recruited just under 50 members, again paying £20 each. We trained another beekeeper but have yet to set them up with bees, she will get going in Spring 2012. We did get a small honey harvest which we used to bake some honey buns at a group meeting with the surplus being shared out to those that wanted some. The first top bar hive got used but unfortunately not for long as wasps drove the bees out. The Plants for Bees project got off the ground with a flourish, as did the Education and Outreach one. As a group we grew quite rapidly and have had to adopt a slightly more formal set-up, with roles and leads more tightly defined. Alongside this we have set up a programme of meetings and events for 2012, each of which will be followed by a newsletter. In the third year we again hopefully recruit a similar number of members, again with subscriptions remaining at £20. We aim to train another two beekeepers and build our colony numbers up so that each is responsible for two hives. If we succeed the honey and wax share will increase. Plants for Bees and Education and Outreach will continue to develop their projects. •	The chance to attend a beekeeping course paid for by BCB with the Waveney Beekeepers Group, followed by being set up with one or more of the group hives. •	An invitation to the honey harvest and bee party every Autumn. •	Regular updates and photos via the BCB pages on the SB website. •	A share of the wax and honey. BCB will be as much about caring for bees as about bee products: yields cannot be guaranteed and, certainly in the first few years as the hives establish, are likely to be very low and possibly non-existent. •	The opportunity to join either of our 2 sub-groups; plants for bees and educational/outreach projects. Consolidation. A similar number of members are recruited, again ideally the same as in years 1, 2 and 3 with the subscription fee to be determined depending on the wishes of the group. General concensus could ask for a reduced fee or for funds to go towards education or planting within the community. The only expenditure is insurance for 6 beekeepers, consumables and extra equipment that might be required. During this year the merits of the various hive types are assessed. Same as year 4, or the group might decide to repeat the growth cycle for a little longer. Over time the honey and wax share should increase to the point where a £10 annual investment delivers an excellent return in honey and other hive products – but it could also be that in some years we produce little or nothing. A big thank you to everyone involved in organising the Unleashing and to all those who came along (just over 70 in the end) – it wouldn’t have been quite the same without you! Special thanks to Shaun Chamberlin who gave up his Saturday night, trekked up from South London, and gave us a fantastic presentation. His coverage of peak oil and climate change was incredibly lucid and really helped to set the context within which Transition, and indeed everything, works. Shaun went on to talk about the importance of cultural stories, the timeline process and the power of community action; suitably inspiring and empowering after the reality check presented in the first half of the talk. If you’d like to have a look at Shaun’s website, Dark Optimism, it’s here. If you’d like to buy a copy of his book, The Transition Timeline, we still have a few copies left and can offer them at £8 (ex. post and pack – we also have some copies of theTransition Handbook at the same price). We’ve uploaded some photos of the unleashing here. If you took some pictures and would like to share them do get in touch (contact email in the top left hand box), we’d love to see them. We also got some positive press coverage with articles in the Bungay and Beccles Journal and Waveney Advertiser and the same article in the EDP (hard copy) with a mention on the front page of the Waveney edition. The Timeline: Over the next few days the Timeline – created at the Unleashing, will be transcribed and posted here. By joining Transition East and then becoming a member of the Bungay Group you’ll be able to add to the Timeline. Alternatively you could send us your thoughts via the google group or our e-mail address (both also in the left hand column). Even better, come and meet us all in person. Every third Tuesday of the month we host a Green Drinks event at the Green Dragon in Bungay. The next one will be on the 19th May, there’s a poster here with all the details. On the fourth Tuesday of the month we have a more formal meeting where we manage on-going projects and discuss any ideas that emerged at Green Drinks in more detail; do get in touch if you’d like to attend. Projects / Theme groups: There are things that the group are already doing, such as planning for the next Car Free Day (22nd September), the Big Green Market or the Carbon Audit and we’d welcome extra input on these. But a whole host of new ideas emerged at the Unleashing – from gardening at the library, through setting up a community supported agriculture scheme, to insulating our homes better. Unlike many Transition groups we probably won’t split into theme or sub groups immediately, instead we’ll wait to see what happens at the next few meetings and how the Bungay Timeline changes our current thinking. One of the main things about getting involved in a Transition Initiative for me was the realisation that I might actually be able to share some of what I know with others who might be interested. In the meetings of the Norwich Heart and Soul, Arts, Culture and Well-Being group I’d been attending, for example, I was keenly aware of sitting in a room with all sorts of different people, every one of us with something of value we could do or share. I’d been working with plants, especially wild and medicinal ones, for many years and in many places. So I organised a Reconnection with Nature walk with Charlotte in coastal Suffolk where we live and invited fellow Transitioners from Transition Norwich and Sustainable Bungay, where we’ve been most active, to spend the day with us getting to know some of the neighbourhood plants. The main thrust of the day was to inspire others to get in touch with the plants and trees growing where they live. We based the day on three Transition plants, Nettle, Cleavers and Dandelion – traditional herbs used to spring clean the system and help the body “transit” from winter into Spring. The walk itself was an introduction to many food and hedgerow medicines such as burdock, hawthorn, rosehip, ground ivy, damson and garlic mustard, and a guide to the main native trees. The day also featured a slide show and a delicious shared lunch, including Nettle Soup and a Cleavers Plus Tea. Setting off down the lane. There were young alexanders growing in profusion. This is when they can be used as a pot vegetable. To be honest I find them a bit, well not that tasty. But they are edible and maybe there are better ways to cook them than I have tried so far. When the flowers come out in early summer the smell is lovely, like honey. Remember to be sure of correctly identifying any plant before you eat it. Going out with someone who knows the plants is always the best bet. 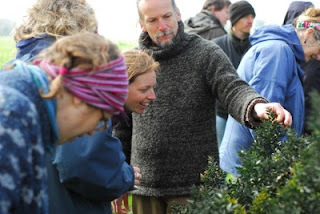 Here I am showing fellow transitioners Butcher’s Broom, a native and prickly plant in the lily family, aka knee holm. Eighteen people took part in a lively and enjoyable event. Karen told us the next week that she had spent the rest of the weekend totally immersed in getting to know the wild plants in her neighbourhood, seeing cleavers everywhere and tasting all sorts of plants she never knew were edible before.